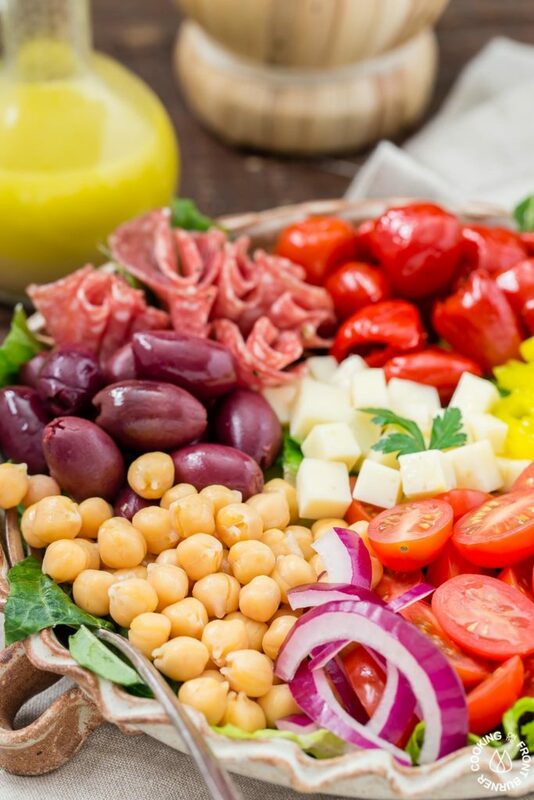 You will love this easy recipe for Italian Antipasto Salad that is loaded with veggies, meat, cheese and a lemon vinaigrette dressing. Make it big for a main course or smaller for side salads. 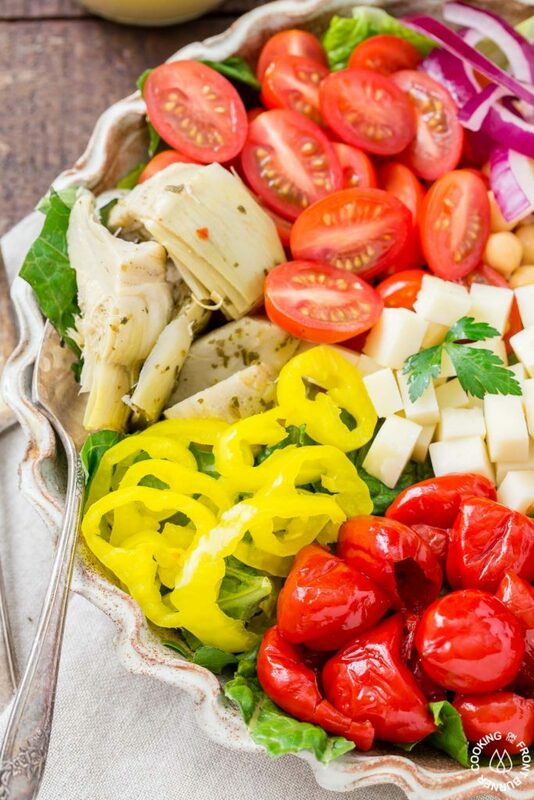 Grab a fork and dive into this fresh, vibrant and tasty salad. It has a colorful presentation, comes together in no time and has an array of textures. 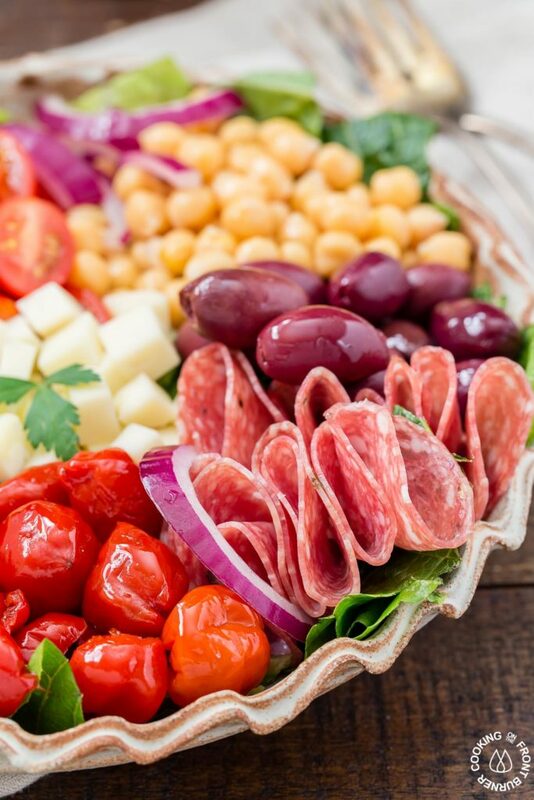 Typically antipasto is the first course of a formal Italian meal with meats and cheeses arranged on a tray for each guest to select what they want. 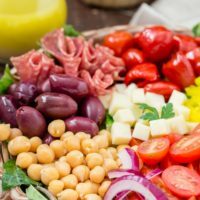 Growing up in an Italian household, my grandmother would just have some thinly sliced meats and a bit of cheese before eating. 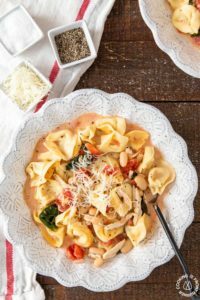 We didn’t want to eat too much beforehand because we knew the second course was going to be fantastic with some sort of homemade pasta! 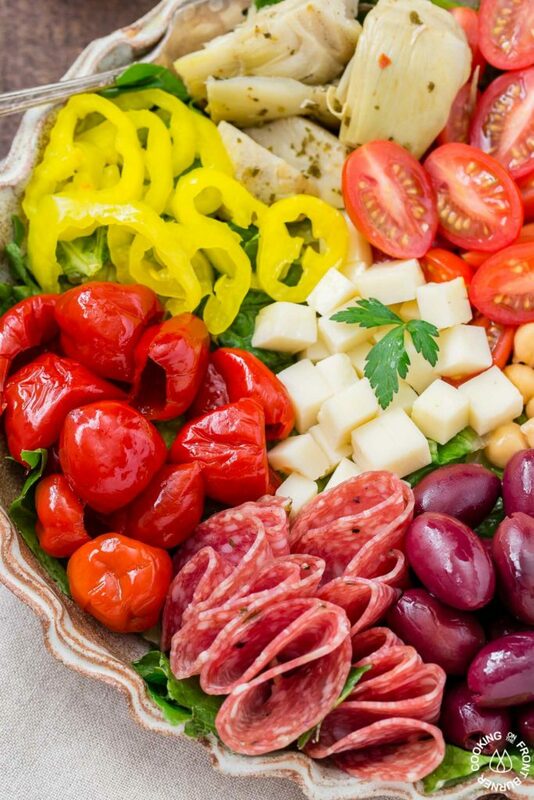 I think the hardest part of constructing this antipasto salad was deciding what to add (or not add). I sure could have gone crazy adding different kinds of cheeses, cured meats and even maybe some marinated mushrooms or perhaps some anchovies (nope that one was not going to happen!). 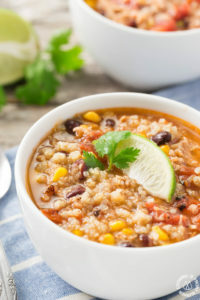 As you are creating your version, feel free to add what your taste buds are craving. 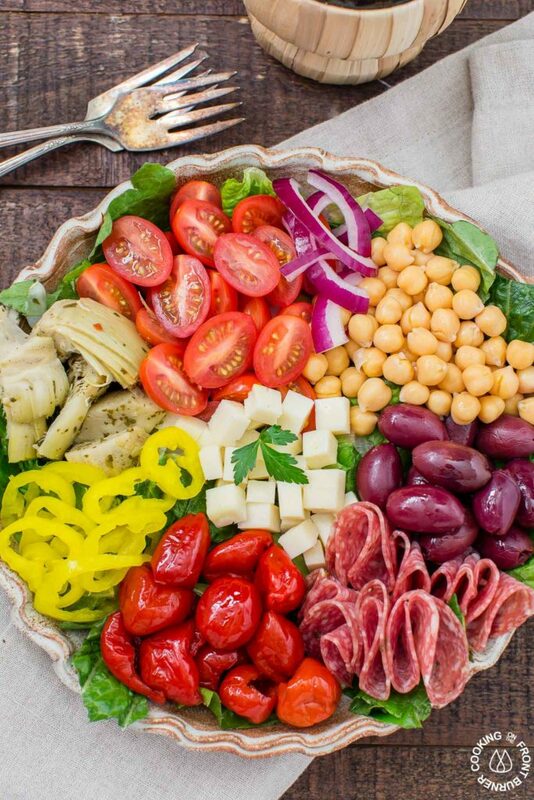 What makes this a salad and not an antipasto tray, is the addition of salad dressing. I used a fresh homemade lemon vinaigrette but you could also keep it simple with just some olive oil and balsamic vinegar. After I drizzled on the dressing, I tossed everything together. The pictures show the salad deconstructed you so can see all the yummy ingredients used. 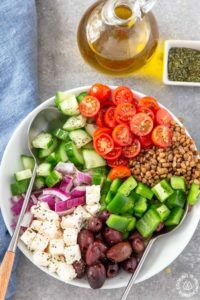 When salad moods strike, be sure to also check out this other Italian Chopped salad recipe on the blog or this Fresh Chopped Greek Panzanella one. I’m all about salads that are quick, easy, fresh and on the healthy side. 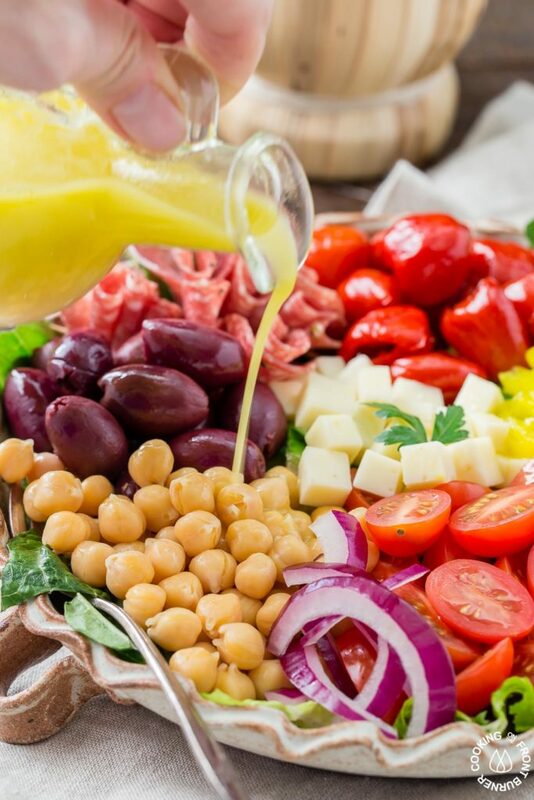 Remember salad dressings go a long way, so just a drizzle is enough. 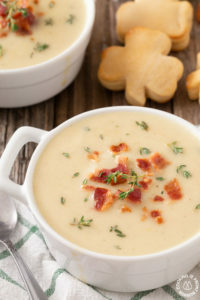 Hope you enjoy today’s recipe!